Homemade White Bread recipe is the famous sliced sandwich bread which is available in the market. It is soft, spongy and fresh made at home with ingredients available at home. You will need instant yeast for this recipe. Bread available in the market often use improvers and preservatives which is not required for this fresh homemade bread. You can use this bread for a day or two but do keep it in refrigerator so it does not spoil! 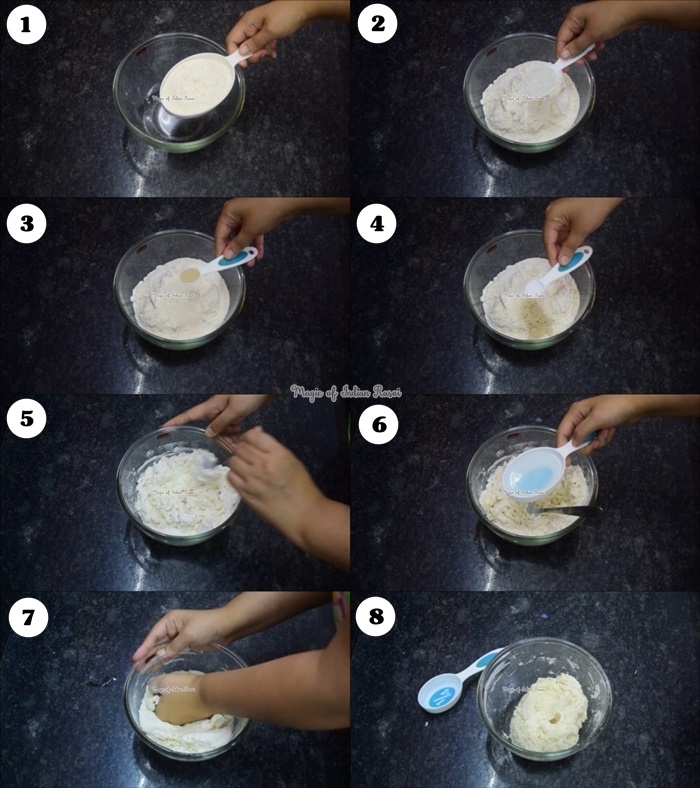 Though this recipe may seem difficult it is quite easy and only the kneading part is a bit tedious. Do try this recipe today! 1. In a big bowl, add flour, yeast, sugar & salt. Mix it. 2. Add lukewarm milk & water and knead a soft dough. 3. Knead forward and backward for 10 minutes till smooth. Grease your hands if needed. Beat by throwing the dough once or twice. 4. 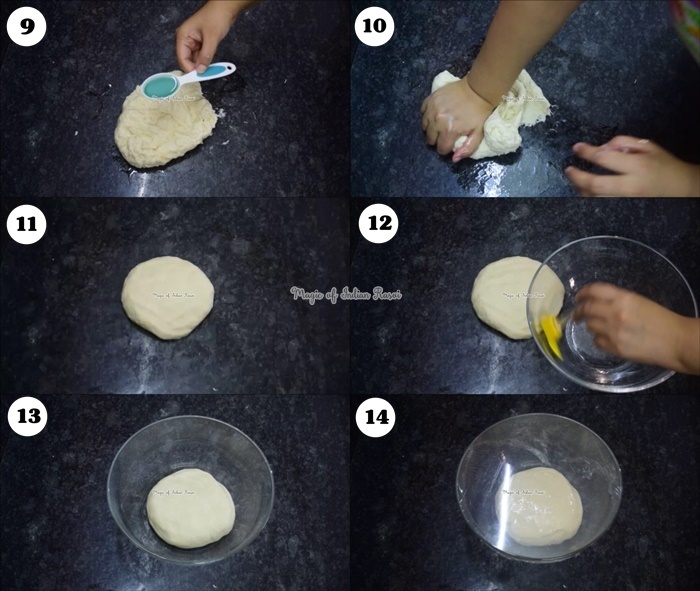 After 10 minutes the dough will be soft and not sticky anymore and can be rolled easily in to a ball with hands. 5. Grease a big bowl with oil. Place the dough in it and even the dough with your hands. 6. Cover with cling wrap and prove it for 1 hour in a dark place. Do not over prove or else the dough will taste sour. 7. After 1 hour it will double in volume. Punch it down and knead again for 1-2 mins. 8. 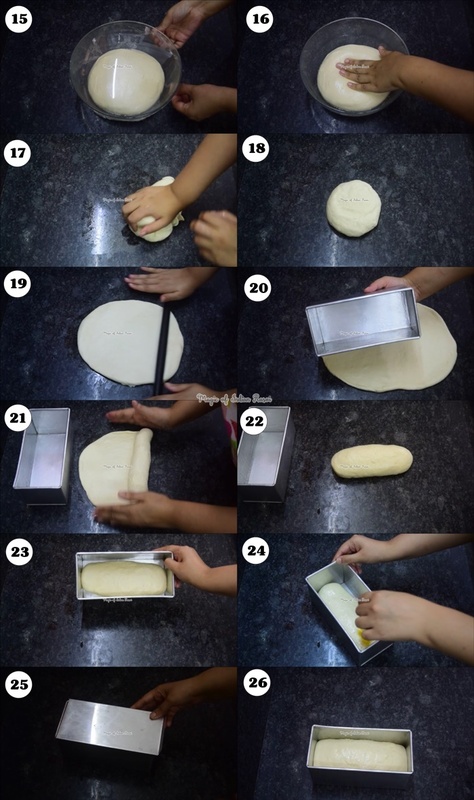 Using a rolling pin, roll the dough into a rectangle shape similar to the the size of the loaf tin (8 inch X 3.5 inch approx). 9. Tightly roll the rectangle into a log shape. 10. Grease the loaf tin & transfer the log to it. 11. Cover it with cling wrap or the lid of the tin and keep it in dark place for second proving for 30 mins. 12. In the meantime, pre-heat the oven at 180C/350F for 10-12 mins. 13. 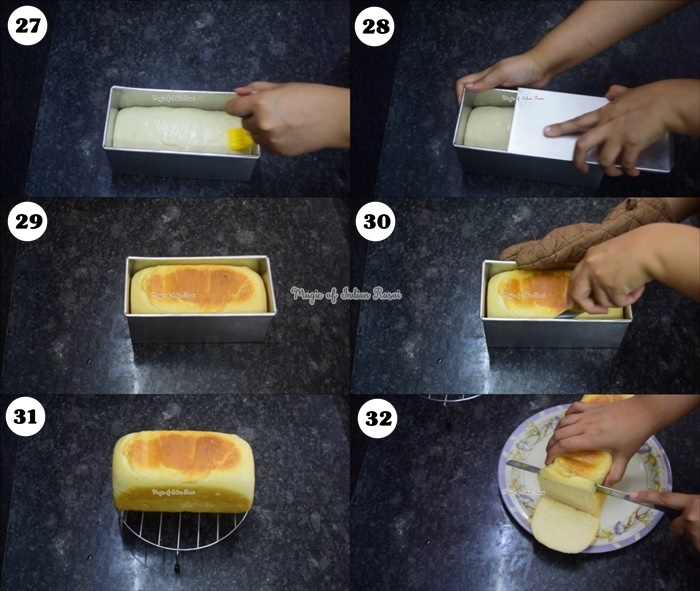 After 30 mins, apply oil on the top of the loaf & cover it with aluminium foil or the lid. 14. Place the tin at the bottom rack (both rods on) & bake at 180C for 30 mins. 15. After 30 mins, remove the foil or lid. Brush the bread lightly with some oil & bake for another 5-10 mins till golden crust forms on top. 16. Once baked, remove the White Bread from the Oven & brush it generously with melted butter. 17. Run a knife along the sides of the tin & un-mould the bread. 18. Transfer the bread to a cooling rack & allow it to cool completely for 1-2 hours. 19. Slice the bread & serve! 1. Dough will feel sticky at the starting but do not add more flour to it. It will become smooth after kneading for 10 mins. 2. Make sure to roll the dough tighlty in a log shape or else there can be visible gaps once the bread is baked. 3. If substituting Active Dry Yeast for Instant Yeast then add the yeast & sugar to lukewarm water (listed in ingredients above). Cover and allow to it activate for 10 mins. Once it is frothy & bubbly add it to the dough mixture. This looks wonderful--thank you for sharing! This recipe is fantastic. Aside from working with sticky dough I had no problem with this recipe. This was the most perfect loaf of bread I have ever made. I'm making this my go to recipe. Thanks so much for sharing! It looks great. Can you suggest me how much active dry yeast should be added to the same recipe instead of instant dry yeast. Kindly guide.